Before I was an artist, I was a writer. While I did many creative things and took a few art classes, what I really wanted to be was a writer; while most people think any degree I might have is in art, I actually have a BA in English with an emphasis on writing, and hoped to go on and study and teach composition at the college level. But employment and a sad economy will make changes in anyone’s plans, and all those years ago I got a job as a typesetter because I could type really well after all those term papers and writing for the college newspaper, and so I entered the world of graphic design, without any intention or training, though I’d designed plenty of things I’d written by then. I’d always wanted to pursue those higher degrees or that job as a writer, but instead stayed with a job I found I could combine with my writing and editing skills into something I’ve found both fun and fulfilling as a career for 30 years. I’ve been working on a computer all that time, but I also brought in illustration and fine art in the good old fashioned way, with my hands. I have my cats to thank for being an artist. When, as an adult, I chose to pick up a pencil and paper and put them together, it was because images of my cats kept appearing in my thoughts as pencil drawings and paintings and I decided to draw what I was envisioning. While I render many other subjects now it all began with my cats and the hopeless affection I felt for each of them and all their moods and quirks and manners of affection toward me. This is the gift they gave to me, and I will be forever in their debt, spending a lifetime to pay it off by sharing them with others. I have had no shortage of feline models after rescuing and fostering since the mid 1980s. Through the years my cats have been the subjects of dozens of works, and others, seeing these works, want a similar piece with their own animal companion as a subject. I have had the pleasure of creating more than 100 commissioned portraits of cats, dogs, cats and dogs, and cats and dogs and people. They are gifts for loved ones, memorials to cherished companions who’ve gone before us, and lovely pieces of artwork featuring an animal a person loved. Animals give us so much in everyday life, but my cats have given me my career. Because cats and dogs and animal welfare issues are a big passion of mine, I work frequently with local animal welfare organizations both in fostering and in donating materials for their benefit auctions. I also paint other subjects, my beloved local landscape I’ve been wandering and studying as since I was a child and my gardens as well as others’ just to start. I carry a sketchbook around with me to capture scenes around the house and out in the street in pencil and ink. I can store a half dozen paintings in my head from one walk in the woods, I grow flowers to paint in the garden and as still lifes, and I don’t leave out the fruits and vegetables either. Under the supervision of my cats, I have the joy of working at home to design books, web pages, logos and various printed materials for a variety of customers as well as creating illustrations, photographing events, writing articles, fiction and poetry, and completing commissioned animal portraits and other commissioned work. I don’t have a degree in art—I have a BA in English with minors in Graphics and Professional Writing. I had majored in art for a year or two, but looking at my output, decided that I was never going to “get it” while I was in college, plus I wanted to be able to get a job when I graduated, so I changed my major to my other acceptable and enjoyable subject, English. I loved my literature and language studies and intended to continue on in a Master’s degree in writing or language studies, but got tired of being a poor college student and decided to take a break after my undergraduate degree. I switched around in several jobs in Public Relations and worked for a while as a freelance decorator for a shopping mall. I got a job as a typesetter (a job which no longer exists with desktop publishing), which entered me into the wonderful world of graphic arts. I stayed with this, starting to take a few more English classes, and ended up taking care of my parents and never returned to school. A few years outside of college, I picked up my drawing pencils and paper and started to draw little sketches from photographs I had taken. I continued with this, taking a model study class to encourage myself to draw from life. I delved into pen and ink, charcoal, then, when I wanted to work in color, pastel—mostly because I was working irregular hours at the time and wanted to work in a medium that would allow me to work for short periods of time without setup or cleanup, and leave a piece for weeks on end. Aside from my artwork and animal welfare activities, I also participate in local environmental activities as a volunteer garden steward for the Western Pennsylvania Conservancy, and work with several environmental organizations in the Lower Chartiers Watershed to publicize issues, events and activities in the watershed. Under the supervision of my cats, I have the joy of working at home to design books, web pages, logos and various printed materials for a variety of customers as well as completing commissioned animal portraits and other commissioned work. I also get to create neat new things to sell as merchandise in their images. Visit Commissioned Pet Portraits, Animal-inspired Merchandise and my Etsy shop as well to see the latest selection of stuff inspired by my household of kitties. And if you’re so inspired to pick up a camera or a brush or other creative medium, I often write about creating my daily sketches and photos, and one of my regular features is called “The Artist’s Life” where I enjoy digging up things I did in sixth grade and things I did last week and discussing my techniques, my inspirations and my personal growth as an artist and writer. I am a professional member of the Cat Writers’ Association, and this very blog won a Muse Medallion for entertainment in the 2011 Communications Contest; in 2012 I won a total of 13 Certificates of Excellence. Please visit my page for the Cat Writers’ Association for my awards in the annual contests. 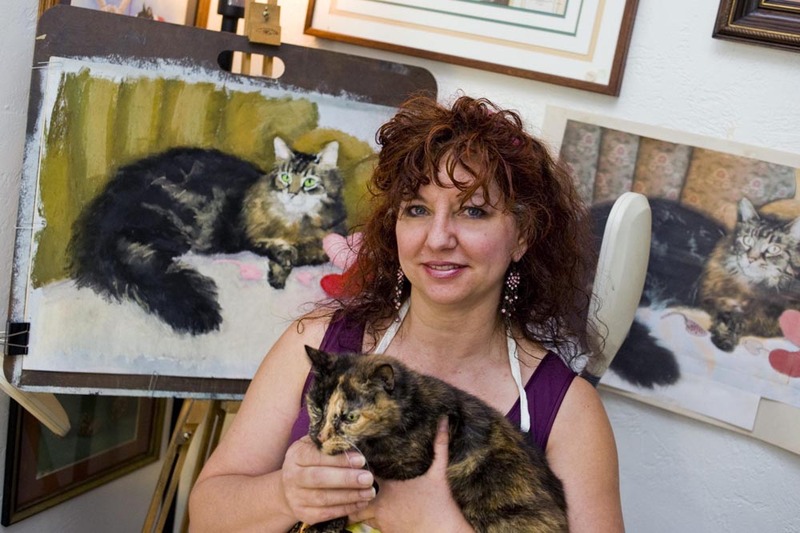 Animal portrait artist Bernadette Kazmarski of Carnegie has a secret as to why her cat renderings are so beckoning, even if the subjects have passed on. The business writer in my local paper featured me and my calendars, art and work with cats in the business column in this week’s paper. I’m so honored to have all this information written up in one article, and to be recognized locally for what I do. Click here to read the article in the Carnegie Signal-Item. Christine–thanks! And I used to have a link in my page footer, who knows where that went. I’ll send you an email. Hello Bernadette–Christine Michaels here fellow CWA member. You have such amazing content and illustrations/sketches! Gosh how I wish I was more artistic. Also trying to reach you for permission to use one of your photos. Please contact me. many thanks! Saw the article online from the Post Gazette about your latest award! Congratulations! Your pastel that they show of your two cats remind me of the style of artist Franz Marc. Thank you for sharing your story. Your art is wonderful! I’m so glad that you have been able to pursue it. I am a performing artist, so I know how hard it can be out there. I have nominated you for the Sunshine Award http://playfulkitty.wordpress.com/2013/12/31/ending-the-year-with-awards/. Stop by my blog anytime to pick it up! Thank you! I’ll be by soon, and Happy Mew Year! Pingback:The Creative Cat - A One-year Anniversary of the “New” Creative Cat! Hi, I wanted to recognise your blog and have nominated you for a one lovely blog award: http://northhighlandsart.com/2012/08/06/one-lovely-blog-award/. Laura, thanks so much! I don’t know how I missed your blog–I visited your website, but I just signed up. Looking at your pencil sketches makes me want to do a few as well! I usually do my awards on the weekend when I have more time to think of answers, and this time I don’t think I can recycle my prior “seven things about me”! Mark, thanks so much–but yours keeps getting more lovely every day! I moved around the time you were becoming a star and I figured I’d catch up with you later on. Thanks for dropping by! Pingback:- Welcome to the New Creative Cat! Hi, I’ve nominated you for The Kreativ Blogger Award, and I know some people don’t do the award thing, but if you chose to accept all you have to do is list seven facts about yourself and nominate a further seven blogs, listing them in your acceptance post and informing them personally by comment or email. Mark, thanks! Your blog is so much more creative than mine! I love all the headers and backgrounds and so on, but I’m very flattered you nominated me. I’ll get to my response. Well, my wrapping is pretty but you are a great painter and your observations of cat behaviour are sublime. I always laugh when I open your posts. You truly are talented! Great artworks on your website! I could not help leaving a comment to express my admiration for you and your work. (Honestly, I don’t know how you find enough time in the day to do all that you do!) Your portraits are stunning, and your writing style is captivating. I look forward to reading about your upcoming ventures, in both the art and animal world! Thank you for visiting! All the way from Italy–how exciting! And I truly enjoyed my visit to your blog as well. I love your cards. I’ve been working on a looser style lately, not so serious! Looking at others’ cards is always in inspiration. Wonderfull blog. I love your work. Keep it up. Cheers, from a cat lover. I am blest to have the love and companionship of our pets. They take very good care of me, as I do of them. God(dess) protect the precious and defenseless animals awaiting loving homes. So many are being put to sleep because shelters are bursting.